No. 9 Lions tripped up by No. 25 Augustana. CONROE – The No. 9 Texas A&M University-Commerce softball team fell to No. 25 Augustana, 4-1, to close out the Arkansas Tech Winter Invitational on Monday morning at the Scrap Yard Sports Complex. A&M-Commerce is now 5-1 on the season after a strong overall performance at the ATU tournament. The Lions return to action at the St. Mary’s College Classic on Friday through Sunday in San Antonio. – Ciera Nunez (Amarillo – Randall) went 2-for-4 with a stolen base. – Kimber Neal (Humble – Atascocita), Bri Sims (Rowlett), and Kynslee Noriega (Kyle – Lehman) each notched hits, with Noriega driving in a run with a double. – Kinsie Hebler (Cypress) was tagged with the loss to fall to 0-1 on the season, allowing three runs on four hits in 4.2 innings. The Lion offense got runners on base early in the game but struggled to convert, stranding runners in scoring position in the first and third inning. Hebler worked around Augustana baserunners in the opening stages and had a perfect inning in the fourth. A&M-Commerce scratched across the game’s opening run in the fourth. With a runner on second thanks to a leadoff single and advanced on a fly out, Noriega doubled to the right-center gap to plate the run and put the Lions up 1-0. Augustana rallied with two outs in the top of the fifth. A walk and a single put runners on base, and an Ashley Mickschl triple to left-center put the Vikings up 2-1. A two-run homer just over the left field fence pushed the lead for Augie to 4-1. 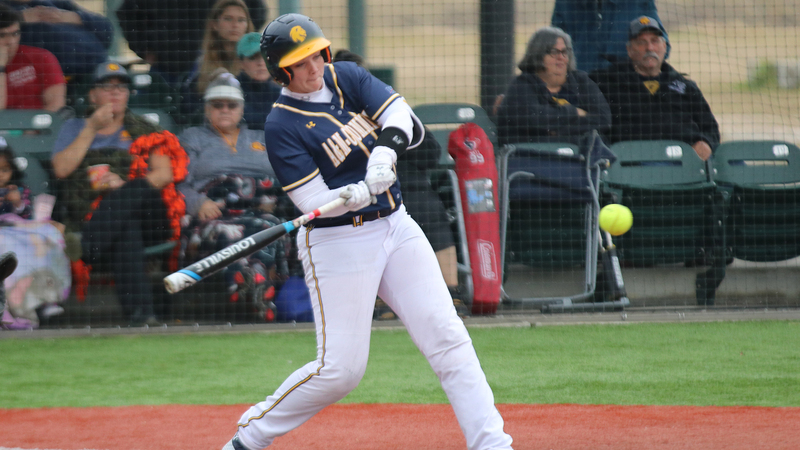 The Lions were retired in order in the fifth and stranded a runner in the sixth, while Emily Otto (Richmond – Lamar Consolidated) kept the Vikings off the board in the sixth and seventh to keep A&M-Commerce in striking distance. Vanessa Muro (Oak Hills, Calif.) walked in a pinch-hit situation with one out in the seventh, but the next two Lions were retired to end the game. No. 9 Lions roll in wins over Central Oklahoma and Colorado Mines. CONROE – The No. 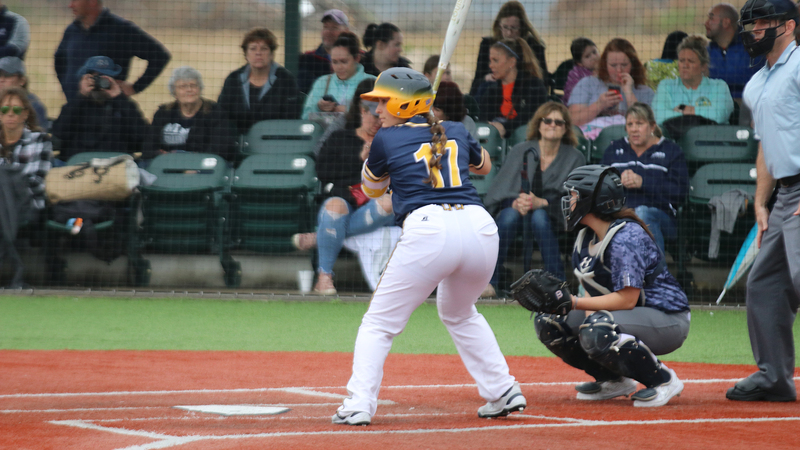 9 Texas A&M University-Commerce softball team ran its season-opening run to five straight wins with victories over Central Oklahoma and Colorado School of Mines at the Arkansas Tech Winter Invitational. A&M-Commerce (5-0) defeated previously unbeaten Central Oklahoma, 10-0 in five innings, then beat Mines, 9-1. The Lions wrap up the ATU event on Monday at 9:00 a.m. against No. 25 Augustana. – Emily Otto (Richmond – Lamar Consolidated) earned her third win of the weekend, allowing only three hits and a walk against four strikeouts in the complete game shutout. – Bri Sims (Rowlett) smashed her third homer of the season and drove in three runs with the long ball and a sacrifice fly. – Kinsie Hebler (Cypress) and Chealsea Slider (Texarkana) each drove in runs. – Kimber Neal (Humble – Atascocita) had a double and scored three runs. – Ciera Nunez (Canyon – Randall) went 2-for-3 with two runs scored. The Lions jumped on the board with four runs in the bottom of the first. Nunez led off with a hard-hit single off the pitcher, then scored on a botched double play attempt. A wild pitch plated Neal, then Sims blasted her third homer of the season down the left field line to give the Lions the early 4-0 lead. Noriega singled to lead off the second and Hill’s single put runners on the corners. Pinch runner Ta’Lyn Moody scored on a double steal attempt. A series of walks and hit batters loaded the bases and Hebler’s bases-loaded walk plated another run. Sims was narrowly short of another homer and settled for a sacrifice fly to put the Lion lead at 7-0 after two innings. After Otto rolled through the third and fourth innings, the Lion bats did their best to put an early end to the contest. Neal led off the fourth with a double down the left field line and scored when the UCO pitcher airmailed the throw on Kilcrease’s sacrifice bunt attempt. A dropped fly ball with two outs added to the run total, and Slider put the cap on the game with an RBI single. 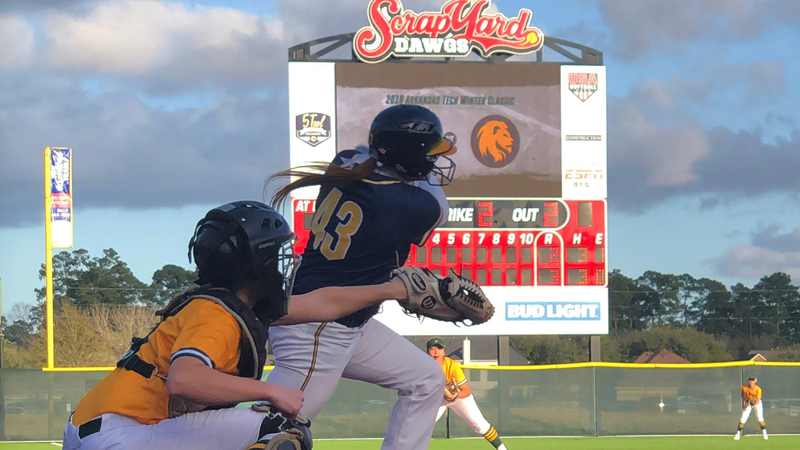 Otto continued her dominance in the top of the fifth with a strikeout and two infield outs to bring the Lions their fourth straight win to start the season. – Madison Schaefer (Frisco – Independence) smashed a home run for her first collegiate hit. – Neal went 2-for-3 with four RBIs, two walks, and two runs scored. – Nunez led off the game with a triple and scored a run. – Kynslee Noriega (Kyle – Lehman) and Jodie Hill (Heavener, Okla.) each scored two runs. – Alexis Velasquez (Amarillo – River Road) earned the win in her first collegiate appearance, allowing no runs on four hits and two walks in 5.2 innings of relief. Nunez started the game with excitement, tripling down the right field line. Neal scored, and the leadoff duo executed a delayed double steal to plate the first run. After a hit batter and a wild pitch, Neal scored on a passed ball to give the Lions an early 2-0 lead. In the bottom of the inning, Dean encountered some control issues, plunking three consecutive Orediggers to load the bases with two outs. A walk brought home a run and cut the lead to 2-1. Mines’ pitching also had issues with control, with a hit batter and a walk putting two Lions on board. After a groundout moved the runners into scoring position, Neal continued her hot streak with a two-run single to left-center moving the Lions ahead 4-1. After a pair of walks allowed the Orediggers to threaten, Velasquez came into the circle with one out and retired the next two batters with weakly hit balls to squelch the CSM opportunity. Nunez’ speed forced an Oredigger error in the fourth, allowing Noriega to score after a leadoff single, pushing the Lion lead to 5-1. Schaefer pushed the lead to 6-1, leading off the top of the fifth by blasting a homer to left field for her first collegiate hit. The Lions put the game out of reach in the top of the seventh. After a run scored on a bases-loaded wild pitch, Neal poked a two-run single into right-center for her seventh hit of the weekend. The clutch hit pushed the Lion lead to 9-1 going into the bottom of the seventh. After a single got an Oredigger on base, Schaefer makes a cannon throw to first to double the runner off and end the game with the Lions on top again. Svaerd and Clark shine as Lions improve at Texas Tech Open. LUBBOCK – More records fell, as the Texas A&M University-Commerce track and field teams continued their improvement at the Texas Tech Open on Friday and Saturday. 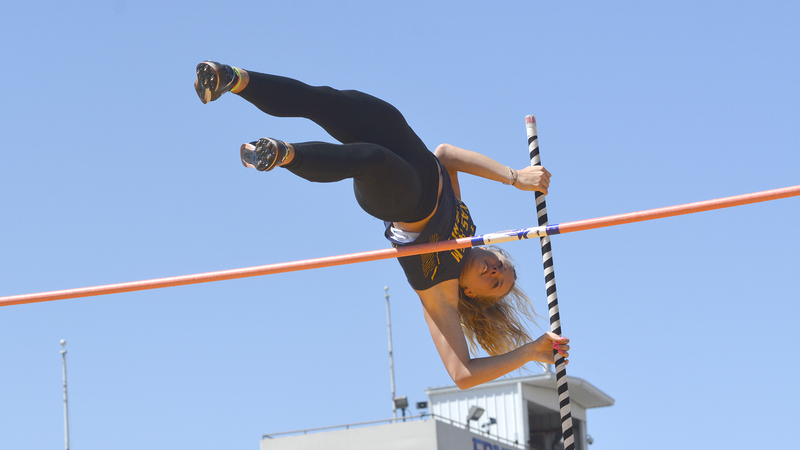 One of the meet’s overall highlights came in the women’s pole vault, where Minna Svaerd (Karlstad, Sweden) established a Lone Star Conference and school record, clearing 3.90 meters (12-9 ½) on her second attempt. She now ranks fifth nationally in that event. Svaerd was also part of the women’s 4×400-meter relay team with Atiana Alexander (San Antonio – Northside Taft), Joy Spann (Frisco – Lone Star), and Ro’Nisha Simpson (Tatum), which improved their provisional qualifying time to 3:49.93 (converted to 3:50.37 for altitude). That time ranks 14th nationally. Rashard Clark (Los Angeles, Calif.) caught the nation’s attention in the quarter-mile, posting a top 10 time in Division II history in the 400-meter dash. His time of 46.52 seconds (converted to 46.63 for altitude) is the 10th-fastest time in Division II history and second-fastest in the nation this season. In the same heat, D’Lance Sharp (Commerce) posted a top 20 time in the nation, crossing the line in 48.15 seconds. In the men’s 800-meter run, newcomer Timon Kemboi jumped into the top 20 nationally in his second-ever American race, crossing the line in 1:52.65. Robert Wood (Wylie) moved into the top 20 nationally in the men’s pole vault, clearing 4.88m (16-0). Eboni Coby (Lancaster) improved her qualifying time in the 60-meter dash to 7.63 seconds, which ranks 21st nationally. Hailey Wanoreck (Beaumont – Hamshire-Fannett) was only four centimeters short of a school record in the women’s weight throw, moving up to 18th nationally at 17.75 meters (58-3). 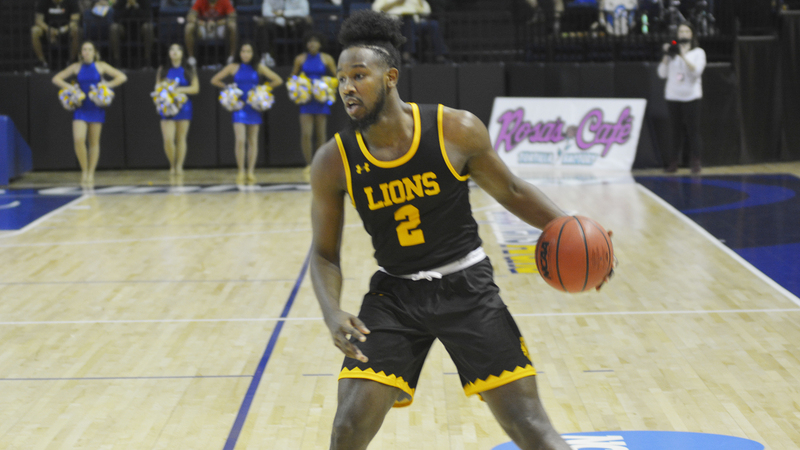 Valiant Lion comeback falls short in 81-67 loss to Angelo State. SAN ANGELO– The Texas A&M University-Commerce men’s basketball team fell 81-67 to Angelo State on Saturday. After trailing by 22 in the second half, the Lions cut the ASU lead to just six late but could not overcome the deficit. The loss brings the Lions to 16-5 and 8-3 in the Lone Star Conference. The Rams improve to 15-5 and 8-3 in conference play. The Lions return home on Thursday for a game against Cameron. The game will be played at 7:30 p.m. at the Field House. The game will be preceded by the Lion women against the Aggies. Tickets for the doubleheader are available at WeAreLionsTix.com, by calling (903) 468-8756 or by visiting the Lion Sales & Service Box Office in the Field House. – Trey Conrod (Kilgore) led the team with 17 points, going 7-of-12 from the field. – Willie Rooks (Houston – North Forest) had 16 points and led the team with seven rebounds. – Deonta Terrell (Chicago, Ill.) had 14 points and led the team with three assists. Carson Tuttle (Mukilteo, Wash.) also scored in double figures with 11 points. – The Lions shot 58 percent in the second half after shooting 30 percent in the first. – The game was spotless as the teams combined to commit just 17 turnovers. The Lions got off to a cold start to the half, being held scoreless for the first three minutes of the game. Rooks made the first shot of the game for the Lions. ASU held an early 9-2 lead. The Lions began to hit shots, and the teams traded buckets for several minutes. Midway through the half, the Lions trailed by eight. The Lions cut the lead to six points with nine minutes to go in the half before ASU went on a 13-0 lead to pull away. Rooks hit a buzzer-beating three to send the Lions into the half trailing 39-19. Rooks led the way for the Lions with seven points. The Lions were held to 30 percent shooting in the half while ASU shot 55 percent. The Rams pushed their lead to 22 points early in the half before the Lions began to push back. Conrod hit an early three and also had a three-point play. Terrell also had multiple baskets as the Lions cut the lead to 13 points with 13 minutes to play. The teams began to trade baskets, with the Lions unable to cut the lead under 12. With six minutes left, the Lions trailed by 14. The Lions made one final push in the last five minutes of the game. Tuttle hit a three and Conrod made a layup to cut the ASU lead under 10 points. Conrod hit another three, and a putback layup by Rodney Brown cut the ASU lead to just seven points with less than three minutes to play. At the two minute mark, Terrell hit a layup, and the ASU lead was only six points. It was not meant to be however as ASU hit its free throws and the Lions couldn’t get the points they needed to get over the hump. 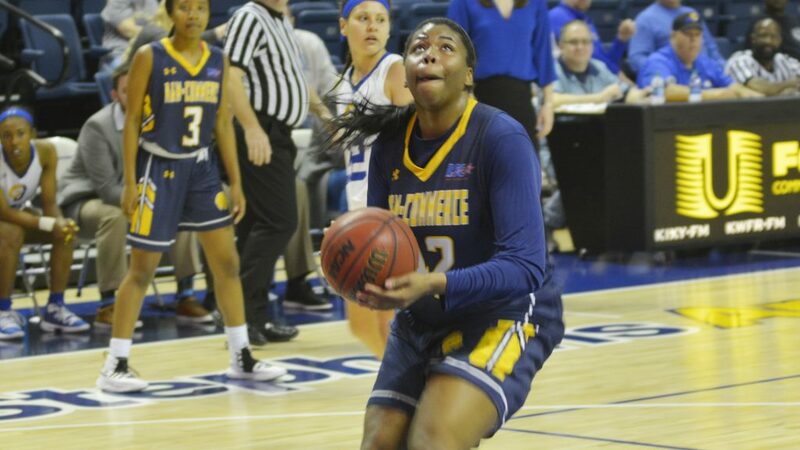 SAN ANGELO– The Texas A&M University-Commerce women’s basketball team lost 84-70 to No. 20 Angelo State on Saturday. The Lions fell behind in the first quarter and could not overcome the deficit. The loss brings the Lions to 13-7 on the season and 8-4 in the Lone Star Conference. The Rambelles improved to 16-2 and 11-1 in conference play. The Lions return home on Thursday for a game against Cameron. The game will be played at 5:30 p.m. at the Field House. The game will be followed by the Lion men against the Aggies. Tickets for the doubleheader are available at WeAreLionsTix.com, by calling (903) 468-8756 or by visiting the Lion Sales & Service Box Office in the Field House. – Ekaterina Zhibareva (Liske, Russia) led the Lions with 13 points in the game. She also co-led the team with five rebounds. – Alexis Bryant (Pflugerville) had 12 points. Alexus Jones (Lewisville – Aledo) had 11 points, and Maddison Glass (Missouri City – Hightower) added 10. – Princess Davis (Shreveport, La.) had eight points and led the team with three assists. With her 29 minutes, she moved into second place in program history in minutes played. – ASU shot 52 percent in the game, including 63 percent in the first half. The Lions shot 36 percent in the game. – The Lions caused 21 ASU turnovers against just 10 of their own. The Lions got off to a strong start, taking 10 of the first 14 points. Zhibareva had two early buckets in the paint, and two threes gave the Lions a lead. ASU answered with a 12-0 run to take a 16-10 lead with three minutes left. ASU pushed its lead to eight before the Lions went on a late run. ASU led 23-20 after one quarter. An early basket by the Lions cut the Rambelle lead to just one point in the second. ASU then made consecutive shots to pad its lead. The Lions kept pace with ASU until the six-minute mark of the quarter when the Rambelles went on a run, taking their first double-digit lead of the day. A late bucket by the Lions sent them into halftime trailing 50-36. Bryant led the Lions with 10 points in the half. Davis added seven points, and Zhibareva had six. The Rambelles were on fire in the first half, making 62.5 percent of their shots in both quarters. The Lions, just like they did in the first half, started the second half on a tear. They went on a 12-4 run and cut the Rambelle lead to only six points. Zhibareva made a pair of baskets, including a three-point play. The Lions trailed 54-48 with five minutes left in the third. ASU charged back, scoring the final seven points of the quarter to take a 61-48 lead into the last quarter. ASU built its lead up to 22 points in the fourth. The Lions cut into the lead to bring it down to just 14 points. But the Lions could not close the rest of the gap. No. 9 Lions hit three homers in 9-6 win over Washburn. CONROE– The No. 9 Texas A&M University-Commerce softball team defeated Washburn 9-6 on Saturday afternoon. After getting ahead early, the Lions lost the lead but fought back and won the game. The win brings the Lions to 3-0 on the season. It is the fifth consecutive season the Lions have started the season 3-0. Washburn – a 2018 regional participant – falls to 0-3 on the year. The Lions return to action Sunday with two more games in the Arkansas Tech Winter Invitational. The Lions will face Central Oklahoma at 9 a.m. and will then meet Colorado School of Mines at 11:30 a.m. Both games will be played at the Scrap Yard Sports Complex in Conroe. – The Lions drew 12 walks, the third most in a single game in program history. – Kinsie Hebler (Cypress) hit two home runs, including her fifth career grand slam. She had six RBIs and two walks. – Vanessa Muro (Oak Hills, Calif.) hit her first home run of the season, a solo shot in the third inning. – Kayla Kilcrease (Kerens) had a single and also drove in a run on a walk. Chealsea Slider (Texarkana, Ark.) also had an RBI on a base on balls. – Kimber Neal (Atascocita) drew three walks and also scored a run and had a hit. Jodie Hill (Heavener, Okla.) had a single and a run scored. – Hebler started the game in the circle, pitching 1.2 innings. Emily Otto (Richmond – Lamar Consolidated) pitched the final 5.1 innings, earning her second win of the season. – Bri Sims (Rowlett) drew two walks. Avery Boley (Fort Worth – Nolan Catholic) and Otto also drew a walk. Kilcrease got the first hit for the Lions as she doubled in the top of the first. After Hebler and Sims drew walks, Kilcrease scored on a walk drawn by Slider. The Lions were not able to bring any more runs across and held a 1-0 lead. The Ichabods answered back with a two-run homer in the bottom of the first. Washburn took a 2-1 lead after one complete inning. The Lions regained the lead with a huge second inning. After a walk from Neal, Hill singled as did Boley. Kilcrease then drew a walk to drive in a run to tie the game. With the bases loaded, Hebler came to the plate and smashed a pitch to left center, bringing in all three base runners. The Lions took a 6-2 lead. Washburn scored three runs in the bottom of the inning to cut the Lion lead to one run after two complete innings. Otto was called into the circle to get the final out of the inning, and she drew a flyout. Muro hit a home run in the top of the third and Hebler hit a two-run shot in the top of the fourth as the Lions built their lead back up. Otto continued to pitch well also, recording two strikeouts and retiring the side in two consecutive innings. After four complete, the Lions held a 9-5 lead. The Ichabods scored another run in the fifth inning, but that was all they could muster. The Lions continued to draw walks but could not get the hits they needed to drive in more runs. The Lion defense held firm, however, not allowing another run to cross the plate as the Lions took home the win. No. 9 Lions kick off 2019 season with two come-from-behind wins. CONROE– The No. 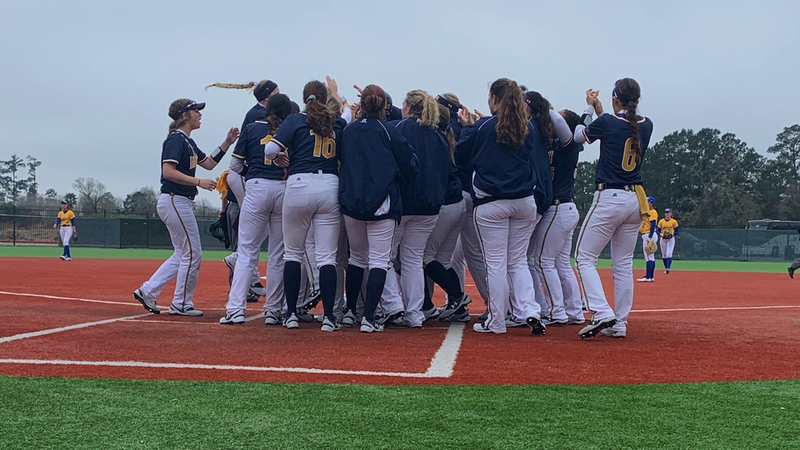 9 Texas A&M University-Commerce softball team kicked off the 2019 season with two wins in the team’s opening tournament. The Lions defeated St. Mary’s 2-1 in the morning before knocking off tournament host No. 20 Arkansas Tech 8-4 in the afternoon. Both of the wins were come-from-behind wins. The Lions are now 2-0 on the season. The Lions have won the first two games in every season of their five-year existence. The Lions return to action tomorrow as they face Washburn. The game will be played at 10:30 a.m. at the Scrap Yard Sports Complex in Conroe. – Bri Sims (Rowlett) hit the game-winning home run in the seventh inning, driving in two runs. – Kayla Kilcrease (Kerens) had a single and scored on the homer by Sims. – Emily Otto (Richmond – Lamar Consolidated) pitched a complete game, striking out seven while giving up just two hits. It was the 14th entire game of her career. – Kynslee Noriega (Kyle – Lehman) and Kimber Neal (Atascocita) also had a single each. Both teams took their time to get their offense going, as both sides had three-and-outs in the first two innings. Otto struck out two batters in the second inning for the Lions. Noriega got the offense going for the Lions, recording the first hit of the season. A bunt single from Neal put two runners on with one out. However, the Lions were unable to get the runners around, and the game stayed scoreless. Otto had two more strikeouts in the bottom of the third. Neither team could get things going in the next three innings either as the defense continued to play well on both squads. That ended in the bottom of the sixth as St. Mary’s leadoff hitter smacked a home run to left field to get St. Mary’s on the board first. Otto got another strikeout to end the inning. The Lions answered back in the top of the seventh inning. Kilcrease led off with a single, and she was driven home on a home run from Sims to left field. The Lions took a 2-1 lead into the bottom of the seventh. Otto completed the game, striking out another batter and not allowing a base runner in the inning to seal the Lion win. – Just as she did in the first game, Bri Sims (Rowlett) hit a home run to left field. She also had the game-winning RBI on a two-RBI single in the fifth inning. She scored a run and drove in three RBIs. – Kimber Neal (Atascocita) had two hits and two RBIs. – Kayla Kilcrease (Kerens) had a hit and scored two runs. Ciera Nunez (Amarillo – Randall) also had a double and scored two runs. – Jodie Hill (Heavener, Okla.), Jordan Sherrell (Schertz – Samuel Clemens) and Lindsay Garner (McKinney – McKinney North) all scored runs. – Katie Dean (Whitesboro) pitched 6.2 innings, striking out two batters and throwing 63 strikes in 93 pitches to get the win. Emily Otto (Richmond – Lamar Consolidated) got the final out on a strikeout. – Nunez, Hill, Sherrell, and Neal all had stolen bases. Neither team had a baserunner in the first inning as the defenses scooped up every grounder hit their way. The Lions then got on the board in the second inning. Kilcrease and Slider both singled to put runners on. After Sherrell came in for Slider to pinch run, Kilcrease scored on a single from Neal. Sherrell scored on a double steal, and the Lions took a 2-0 lead. ATU countered with three runs in the bottom of the second inning. A single and a throwing error put two runners on with no outs. A double scored one run, and a single scored two more as ATU took a 3-2 lead after two complete innings. After two singles and a walk loaded the bases for ATU in the bottom of the third, Dean struck out the next batter to get the Lions out of the jam. The Lions tied the game in the top of the fourth on a homer from Sims. After four complete innings, the game was tied at three. The Lions regained the lead in the fifth inning. Nunez led off with a double, and Kinsie Hebler drew a walk. After Garner pinch ran for Hebler, both she and Nunez scored on a single from Sims. Kilcrease drew a walk and scored on a single from Neal. Dean retired the side in the bottom of the inning, and the Lions took a 6-3 lead into the sixth inning. The Lions pushed two more runs across in the sixth inning. Nunez and Hill both drew walks to lead off. Nunez and Hill pulled off a double steal attempt, and an errant throw allowed Nunez to score. Hill also scored on two wild pitches. The Lions took an 8-3 lead into the seventh inning. ATU had two singles in the seventh to drive in a run and Otto was called upon to come in for the last out. She pitched a four-pitch strikeout and the Lions left with the win. Lions hold on to knock off A&M-Kingsville 80-77 on the road. KINGSVILLE– The Texas A&M University-Commerce men’s basketball team defeated Texas A&M-Kingsville 80-77 on Thursday night. In a game that was back and forth throughout, the Lions held on in the final minutes to get the victory. The win brings the Lions to 16-4 on the season and 8-2 in the Lone Star Conference. The Javelinas fall to 10-8 and 6-4 in conference play. The Lions return to action on Saturday as they travel to San Angelo to face Angelo State. The game will be played at 4:00 p.m. at the Junell Center. – Willie Rooks (Houston – North Forest) led the Lions with 20 points. He made 7-of-11 shots. He also had a double-double with 13 rebounds. – Reggie Reid (Harlem, Ga.) had 12 points and also had two steals. – Deonta Terrell (Chicago, Ill.) just missed a double-double with nine points and 10 rebounds. Srdan Budimir (Karadjordjevo, Serbia) had 11 points. – Trey Conrod (Kilgore) and Rodney Brown (Beaumont – West Brook) also had 10 points apiece. – Both teams shot 42 percent from the field. The Lions made four more free throws than did the Javelinas. The first five minutes was a back-and-forth battle as both teams looked to establish themselves early. With five minutes gone in the game, the teams were tied at seven. The Lions then went on a run, with Reid getting a three and a three-point play. Two more threes gave the Lions a 12-point lead. Midway through the half, the Lions led by 10. The Lions pushed their lead to 14 points before the Javelinas made a run to cut the Lion lead down to just two points at the half. The Lions went into halftime with a 38-36 lead. Rooks led the team with 12 points and eight rebounds while Reid added eight points. The Lions shot 41 percent from three in half. After the Javelinas tied the game early in the second half, the Lions again went on a run, with Conrod hitting two buckets. The Lions once again took a double-figure lead. The Javelinas fought back to cut the lead back down to just one point and at the midway mark, the teams were tied once again. Both teams went on mini-runs before the Lions pushed their lead to eight points at the five-minute mark. The teams traded free throws and baskets, with the Lions holding onto their lead. 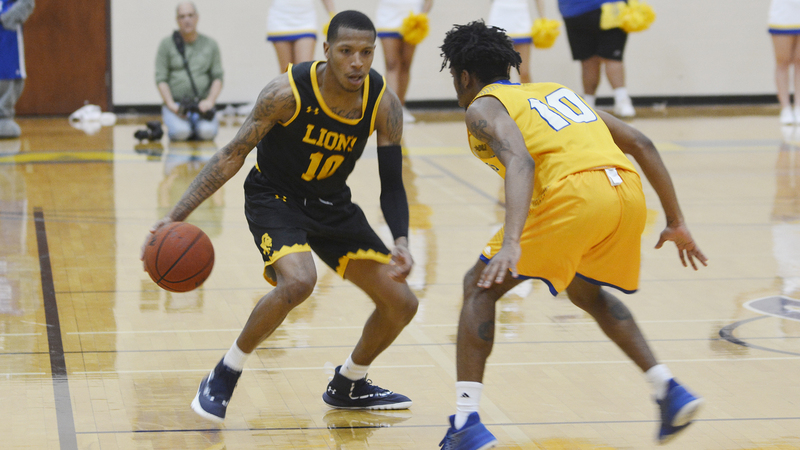 A couple turnovers down the stretch kept the Javelinas in the game but the Lions were able to hit their free throws, and they left with the win. Lion offense explodes in the second half in 91-57 win over A&M-Kingsville. 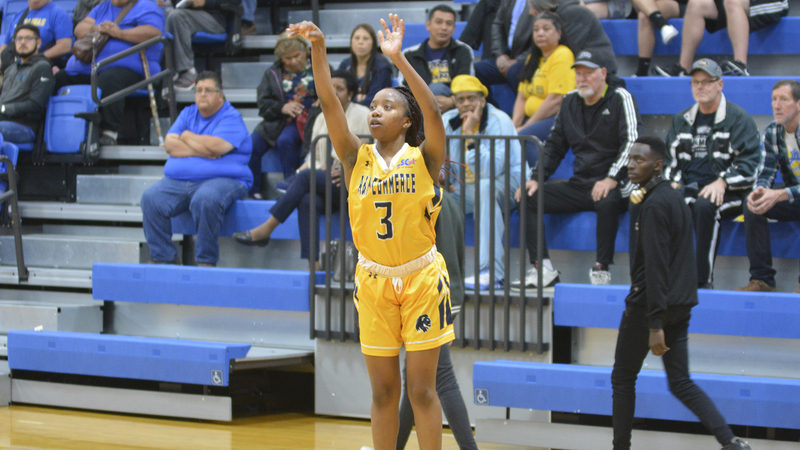 KINGSVILLE– The Texas A&M University-Commerce women’s basketball team defeated Texas A&M-Kingsville 91-57 on Thursday night. The Lions caught fire from the field in the second half to win in a commanding fashion. The win brings the Lions to 13-6 on the season and 8-3 in the Lone Star Conference. The Javelinas fall to 8-10 and 5-6 in conference play. The Lions swept the season series against the Javelinas, winning both games by more than 30 points each. The Lions return to action on Saturday as they travel to San Angelo to face No. 20 Angelo State. The game will be played at 2:00 p.m. at the Junell Center. – The Lions scored 38 points in the third quarter, the second most in a single quarter in program history. – Chania Wright (DeSoto) led the Lions with 19 points, all of which came in the second half. She went 5-of-6 from behind the arc in the second half. – Princess Davis (Shreveport, La.) had 14 points and led the team with five assists. – Ekaterina Zhibareva (Liske, Russia) had 12 points in the game and also had six rebounds. Alexus Jones (Lewisville – Aledo) also scored in double figures with 11 points. – Mykiel Burleson (Pflugerville) led the team with nine rebounds and also had seven points. Delyssa Miller (Arlington – Homeschool) had eight points and seven rebounds. – The Lions shot 40 percent in the game while shooting 48 percent in the second half. The Lions shot 60 percent from three in the second half. – The Lions forced 24 turnovers which led to 27 points. The Lions also had 46 points in the paint. The Lions started cold from the field, missing their first seven shots from the field. The Lion defense held the Javelinas in check early as well. The Lions began to attack the paint as Davis hit two early chances. Midway through, the teams were tied at eight. The Lions took their first lead with three minutes as both sides traded buckets in the final minutes. The Lions took a 15-14 lead into the second quarter. The Lions started the second half on a tear, scoring the first 10 points of the quarter. Offensive rebounds helped the Lion cause as both Agang Tac (Garland – Sachse), and Alexis Bryant (Pflugerville) had putback shots. Zhibareva also got into the scoring by netting a three-point play. The Lions took a 12-point lead midway through the half. The teams traded buckets for the remainder of the half, and the Lions led 33-22 entering halftime. Zhibareva led the Lions with nine points in the first half, while also pulling in four rebounds. Davis had six points. Maddison Glass (Missouri City – Hightower) had four rebounds and led the defense with two steals. Both teams shot 32 percent in the first half. The Lions got to the foul line 13 times in the half and also pulled in 12 offensive rebounds. The Lion offense exploded in the third quarter, more than doubling their first-half scoring output. The Lions opened the quarter with four triples, including two from Wright as she found her stroke. The teams traded baskets for several minutes before another barrage of threes came from the Lions. With three minutes left in the quarter, the Lions had a 20-point lead. It would not stop there. Miller had a three-point play as the Lions continued to pull ahead. A buzzer beater three from Wright sent the Lions into the fourth with a 71-41 lead. The Lions continued to score at will early in the fourth, pushing their lead to as many as 36 before inserting the reserves. The Lion bench also continued to shoot well, and the Lions left with the 34-point win.